floor of our town home open to get fresh air when we sleep. The news hadn’t hit us yet about the two raging fires that were hitting both sides of the state. In spite of the sour smelling air we took our son’s dog, Daisy for our usual early morning two-mile walk. When we rounded the bend to the front of the Clubhouse of our gated community. I photographed the sun blazing through the back of the fronds of a tall, solitary majestic palm tree, giving it the appearance of being on fire. It had a mystical quality to it. Later, we learned about the catastrophic Woolsey fire in and around Malibu that had engulfed Southern California. As if that weren’t enough, we heard news of the Camp Fire in Northern California that consumed 80-90% of Paradise, located in Sierra Nevada Foothills, making it the deadliest wildfire in the state’s history. It didn’t take long before the seasonal winds carried smoke-filled air from the raging fires to entire East Bay including Silicon Valley where we live. Even those who were lucky enough to buy an N95 mask that filters soot from the air, health officials were still advising people against being outdoors. Die-hard Oakland Raiders and San Francisco 49er fans attended their respective games. The risk of exposure to poor air quality in the unhealthy range is that microscopic particles seep deep into our lungs and enter the bloodstream. In times like these when a fire makes a mockery of the name Paradise, by unmercifully burning the small, residential town down to the ground, I turn to the solace and irony of poetry. The air tastes like a stubbed-out cigarette. But why complain? The weather’s fine as long as you don’t breathe. Our hearts go out to all of those who lost their homes and loved ones during this horrific calamity and a deep sense of gratitude to the firefighters and other first responders who risked their lives. Photo 1: I captured in front of clubhouse where we live. It’s been said that if there is a race between a lion and a deer, the deer often wins because a lion runs for food and a deer runs for its’ life. Purpose is often more important than need. Cecile and I were just beginning our early morning walk. She was trailing behind me with Jason’s dog Daisy. Suddenly, I heard a loud rustling noise in the bushes far to my right, and the flash of a large animal appeared through the trees. It was a stag. Startled, It made a sharp turn across the road to the left. I could hear its hooves making contact with a long white catch basin as it clumsily tried to gain its footing. It rumbled across the terrain like a 350 pound thoroughbred then disappeared into the bush. I walked further down the path hoping against hope to get another glimpse. After all, a deer sighting of this kind is not a common occurrence on this large tract of land where we live. Just as I was ready to give up, there it stood, out on the open meadow on my left, maybe 40 feet between us. It stared back at me, as if daring me to make the first move. It's elegant rack etched out against the back drop of the field and the trees like a king of the forest. Time seemed to stand still. I retrieved my camera hoping to capture its image before it fled. I snapped a few shots. I felt like I was in a dream like state, watching something unfold that was surreal and imbued with some sort of meaning. In Buddhism, the deer symbolizes harmony, happiness, peace and longevity. If one were to look up the symbolic meaning behind “stag,” you’ll find repeatedly that the animal represents an in-between state, a world connecting dreams and wakefulness—the world of intuition. The antlers are like a crown, that grow beyond the body, bringing it closer to the sky revealing its sacredness. The fact that the antlers fall and grow again also makes the deer a symbol of regeneration. Antlers are said to act as a spiritual antennae, urging us to be more mindful of our thoughts and perceptions and directing us to a higher state of awareness. In this faced paced world of technology it seems to be a message worth heeding. Cecile and I passed this Royal Blue Hydarangeas on the walking trails with the blue green pond in the backdrop near our townhome. These classic flowers—first discovered in Japan—coalesce together to form a signature globe-shaped head resembling pompoms. They symbolizes heartfelt emotions, used to express gratitude to others for our being understood. The Great Egret visits us from time to time. They boast a showy brilliant white plummage and are found around the world. I have sighted them in Asia, Canada, Africa and Australia. Locally, we have seen them at Shoreline and Vasona Lake. They have long black legs and feet, long graceful necks and straight, pointed, yellow bills. I discovered this one wading patiently in the shallow water of the pond stalking fish. I watched it stab and grab a tiny fish into its mouth. Egrets also prey on reptiles, amphibians and small mammals. I was doing a bit of stalking myself—for that perfect photograph. I managed some nice closeups but was hoping to capture it in front of the waterfall. Well, I got my wish. Feeling I got just a little too close, the egret took off in flight. I not only managed to get a photo of it landing, but when it reached the opposite shore it began moving toward and then in front of the waterfall. Bingo! I had my “money shot.” Now that is what I call a happy accident or was it the power of my intention in operation? When they fly, their neck draws back in to an S-shaped curve. Their feathers are stunning. Sadly, these elegant birds were hunted to near extinction towards the 19th century. Their feathers were used to make hats. Following conservation efforts, their numbers grew well into the 20 century. The Great Egret was chosen as the symbol of the Audubon Society, the environmental organization that was formed to protect birds. 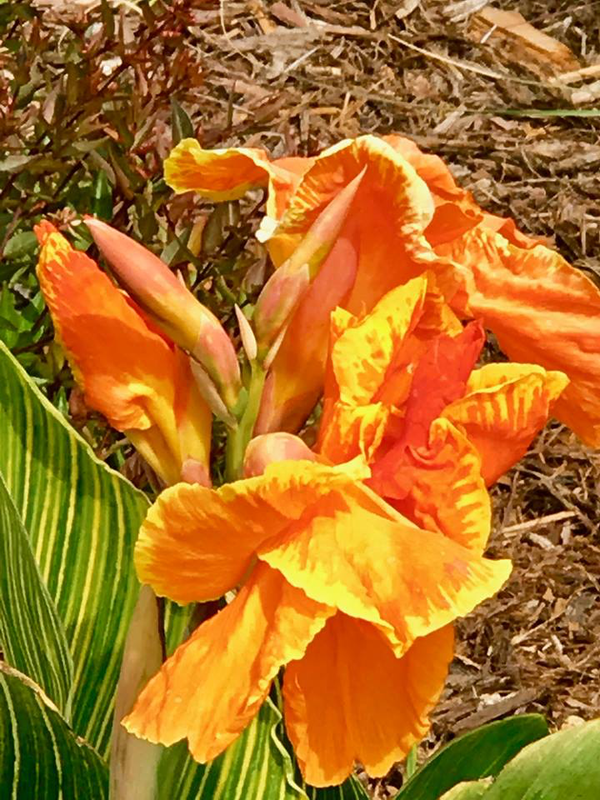 The glorious Tropical Canna Lily has bright large yellow-orange blooms and exotic multi-colored striated foliage. They symbolize magnificent beauty, brilliance of truth and sacredness. It is native to southern Africa. Canna Lilies are also known as the tantalizing water dragon and trumpet lily, though in fact it is not even a lily. It was misnamed by a famous Swedish botanist, Carolus Linnaaeus, and was later corrected by German Koch, a German botanist. Last but not least is the red Epiphyllum Cactus Flowers (Jungle Cactus). Epiphyllums can be found in Mexico, the Carribbean and through Central America and South America. Hybrids like this one, are commonly referred to as “Orchid Cacti” due to their luminous blossoms resembling tropical orchids. They are hardy and easy to grow. I was first introduced to the Empiphyllum by my next door neighbor, Howard who hybridizes them. He has one growing in a pot and in a long planter on our neighboring patio wall. We get to enjoy them during their short blooming period. They take your breath away. In the early morning, mid-day and after dinner, Cecile and I and Jason’s dog Daisy set out on the walking trails literally steps from our door. 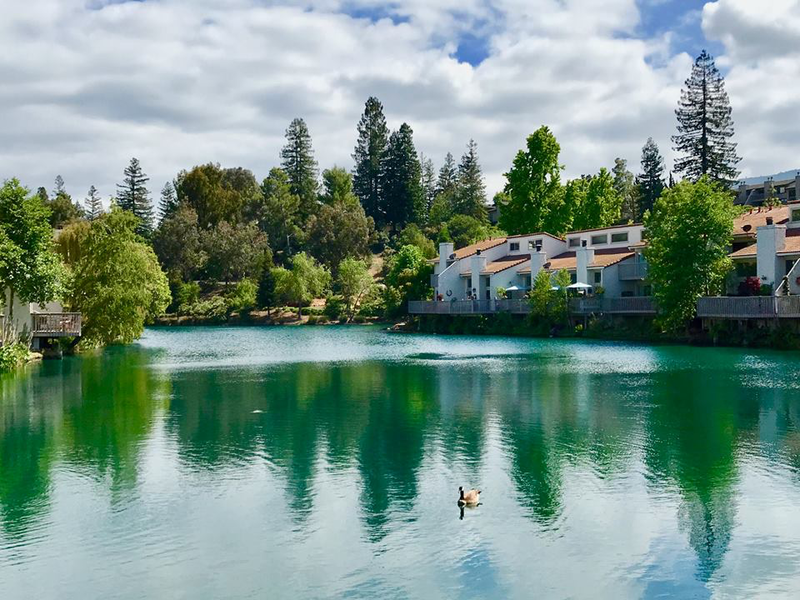 We are immediately transported to a happy place in the midst of a 100 acre wooded area we call home at Rinconada Hills. We pass the cactus gardens I can see from my home office window, a plethora of mature shade trees that line the self-guided nature trails that traverses a wide variety of terrain. The many tiny lizards flit about as they feel the vibration from out feet. We could see and hear the mischievous squirrels shimmy straight up the tallest of trees in a way that defies gravity and then playfully jumping from branch to branch. We see the many shy white cotton tail bunnies (we feared were wiped out by the coyotes) shift about trying to take cover as we draw near. The cherry trees and plum trees are bearing fruit, but too early to eat. the grass. The aromatic smells from the pine and eucalyptus trees clears our sinuses. "Nevermore will a flying flower drift by you unnoticed..."
During a walk on the trails of Rinconada Hills with my wife Cecile, I experienced my first sighting of a Mourning Cloak Butterfly (Nymphalis Antiopa, 1758 by Linnaeaus) basking in the sun. It was laying flat atop a low lying green plant with dry woody stems near the water’s edge of a cascading pond near our town home. I was amazed it allowed me to get close enough to photograph it without flying off. This Mahogany brown butterfly with light tannish yellow edges is named after the funeral shawls worn over a pale dress or petticoat by grieving widows. The darker brown band around the main wing is accented with pale blue-lavender spots that adds to its beauty. The Mourning Cloak butterflies, do not migrate long distances but hibernate over winter through a process called “cryopreservation,” that involves the secretion of chemicals which acts like anti-freeze during the winter months. In the spring they emerge as adults ready to mate (much sooner than other butterflies). Males mate with several females. Sadly, these stunning and graceful creatures live for about a year and die soon after mating. I discovered that the reason it was basking in the sun is to warm up its flight muscles making it possible for it to fly about. Actually all butterflies need to warm up before they can fly. It is theorized that the dark wings of a Mourning Cloak make it easier to absorb the spring sun. The Mourning Cloak is found in many regions of the world including California. One of the reasons it is so widespread is that this striking flier uses a variety of host trees such as the Cottonwood, Willow, Popular and Elm to flourish. Their main diet is tree sap and decaying fruit and they extract salts and minerals form mud. Their main predators are insect eating birds. The males are highly territorial and defend their territory from other males, other butterflies, hummingbirds and even Scrub Jays. They have also been seen head-butting a human hand, demonstrating that even a delicate butterfly can put up a fight if necessary. I was invited to send my photo to inaturalist.org to help scientists interested in studying years fluctuations in the butterfly population. 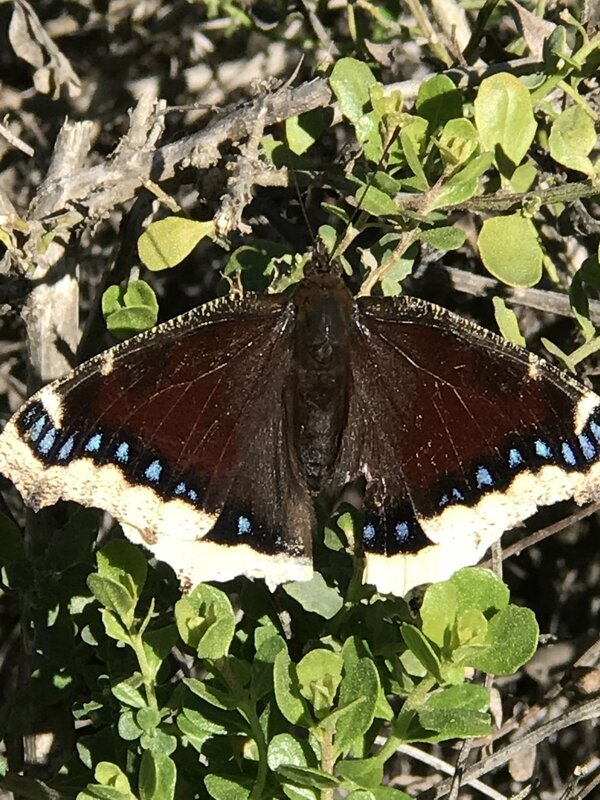 With more rainfall occurring in California following years of drought the Mourning Cloak butterfly has been making a comeback. "Like moody states of mind, no cloud is so dark that the light can't shine through." I’m a big fan of sunsets that are embraced by whimsical cloud formations, especially when they occur right outside our window or can be viewed from the street leading up to our home. A good sunset is one that has the power to stop you in your tracks and say OMG. It’s a romantic encounter with Mother Nature if only for a moment. You know it won’t last, so you savor every bit of its' fleeting presence. I thought I was done shooting and then the crescendo—fiery red clouds emerged as the sun went below the horizon line. A Turtle can withdraw from the world just like humans until they feel safe. Only we lack the cover of a protected shell. At least they have a choice. When they want to bask in the sun to warm themselves they find a log or a rock. If there is no room they climb the back of a larger turtle. When they want to cool off, they float in the water like a moving island. Should they be hungry, they just scan the surface for insects. And, when a small turtle wants to travel it simply hops aboard an “Uber” Turtle to ferry it across the lake—in this case a stones throw from the waterfall near our home. Turtles have poor vision, but can feel every vibration—like a human sneaking up on them. I waited patiently to take these photos hoping these majestic creatures wouldn’t sidle into the water like many times before. Luck or perhaps grace was with me this morning as I was able to capture the moment. What Turtles Taught Me: Turtles are very symbolic, often viewed as the doorway between our world and mythic underworld. In fact, some cultures believe that turtles are actually holding up the world. They are the oldest reptiles dating back from 157 million year ago. It’s shell is modified ribcage and part of its vertebral column. Consequently, they cannot be separated form its shell any more that we can be separated from who we are. Even though turtles don’t mind when other turtles stack on top of their shell, they are not social creatures. That being said, they do show us how to grow old gracefully and about living in harmony with our environment. When we feel anxious, the pace of life gets too hectic, and our minds are spinning out of control, they show us how to slow down and go with the flow. Peace! I had to get up real close and personal to capture the first two photos of a yellow-faced bumble bee. They are docile and peaceful by nature and tend to avoid human contact. However, if they feel cornered—with no avenue of escape—they will not hesitate to defend themselves. These beneficial insects are native to California, and are important pollinator of plants. They are here to help and teach us, not to hurt us. Bumble Bees zig-zag from flower-to-flower collecting its nectar. Their wings beat around 130 times per second. This allows them to perform a unique service called "buzz pollination," vibrating flowers until they release pollen. The pollen then attaches to its sensitive hind legs. The large load they collect is carried in “pollen baskets” which are dish-shaped indentations on their hind legs. The pollen is then passed onto other flowers, creating a process of fertilization. bringing the secrets of life and service. They teach us to be mindfully focused with the matter at hand, and to be fully engaged in our creative endeavors. They symbolize being productive while the sun is shining and to extract and savor the sweetness of life. Many ancient cultures considered bees to be messengers of the gods. My home office overlooks our community cactus gardens on each side of the walking trail Cecile and I mindfully walk on each day. It also reminds me of my late mother, Maria who grew up in Sicily, and loved eating the fruit of the cactus. How fitting that these mysterious succulent plants would become such a source of enjoyment in my retirement years. I first became acquainted with this particular species of cactus plants as a young boy while visiting our family in the old country. We ate the fruit but not until the pinchy spines were peeled away by my nonna—and after it sat chilled in the refrigerator for a few hours. Unlike me, she knew what she was doing. When she cut back the peel, I was surprised to see the color of the prickly pear fruit, which ranged from bright yellow to orange, and evoked a fragrance of citrus. It “did,” look like a pear—with an indentity crisis. The juicy soft pulp contains tiny hard seeds that Sicilians simply swallow. Their taste is similar to a sweet watermelon. They contain 85% water, are rich with Vitamin C, and have lots of other nutrients and phytochemicals. For people who want a little more kick to their fruit, Sicily make a prickly pear-flavored liqueur called “Ficodi” is produced. It has the flavor of a medicinal aperitif. Opuntia Cactus are also seen scattered throughout the Israeli hillside and looks like a natural part of the Israeli landscape. They were actually imported to Israel from Arizona and New Mexico and planted to serve as natural barriers and dividers. In Israeli, the term Sabra (in Hebrew), alludes to the tenacious, thorny cactus plant with a thick skin that conceals a sweet, soft luscious interior. It is a term of endearment for Israeli Jews, who are referred to as being tough on the outside, but delicate and sweet on the inside. In the Native American tradition, cacti represent protection, patience, strength and endurance. They can survive difficult conditions, their roots run wide and deep. They continue to flower in the face of adversity. It is a great metaphor for the human condition that reminds us that we are capable of being strong and resilient, that we can survive whatever life throws in front of us, that we can flourish in good times and bad. "The cactus has all the blessings…It has humility, but is not submissive. It grows where no other plant will grow. It does not complain when the sun bakes it, or the wind tears it from the cliff or drowns it in the dry sand of the desert or when it is thirsty. 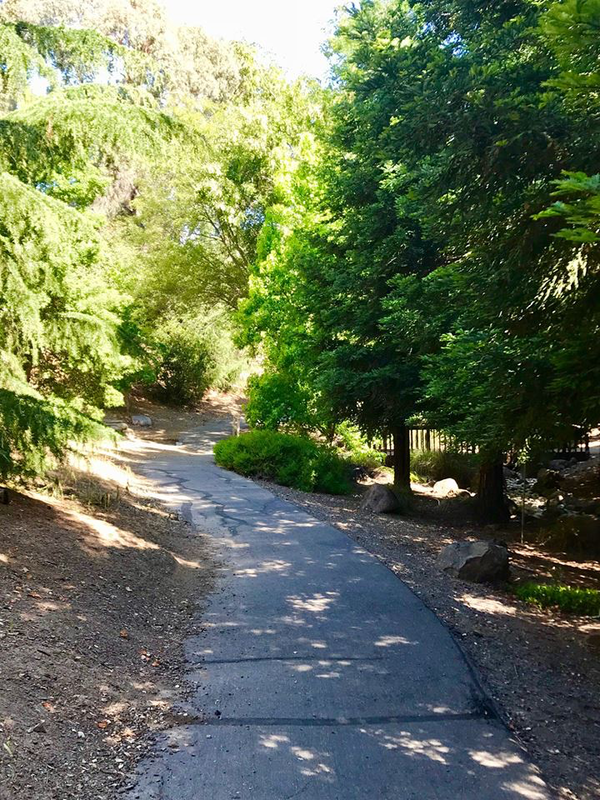 Postscript: Our neighbor, Lucy Vagonov, former chair of the landscaping committee at RInconada Hills is responsible for the installation of the cactus gardens that bring resident walking the trails and walking their dogs so much pleasure. 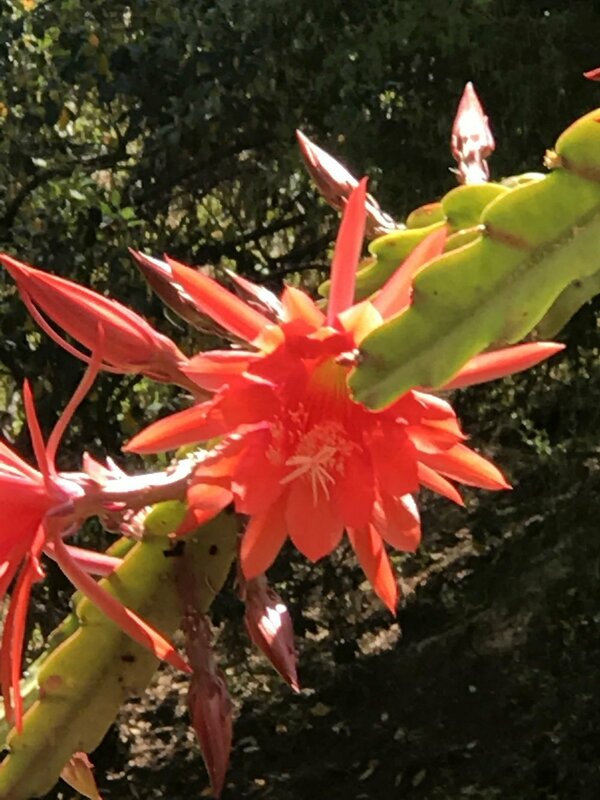 I am grateful to Howard, our next door neighbor, who has been nurturing a bright red cactus flower in a pot that has a short but showy blooming period. 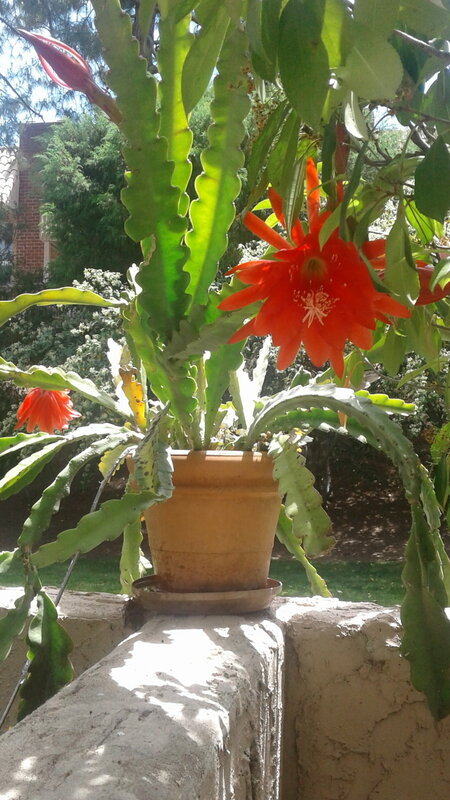 He called it an Epiphyllum (Greek: for upon the leaf), and he has been hybridizing these type of plants for over 20 years. As shown in these photos I took, It sits on the corner of a wall that borders our back yard patio. When the sunlight hits it, it exudes a hypnotic glow and a quaity of stillness and silence that sometimes eludes me during the course of a busy day. I literally “love” this flower, and in a reflective moment, I realized that Love is not about possession, but about appreciation and beauty, and a sacred wellspring that is always available to us if we take the time to see. Recently, our friends Marianne, an artist and children’s book writer, and her husband, Brian a musician, composer and professor of music at San Jose State invited Cecile and I for dinner at their home. We were taken by the luscious grape colored flowers in their back yard. “We planted them to attract butterflies,” Marianne said. She proceeded to show us a photo she took of a Western Tiger Swallowtail Butterfly with striking yellow and black tiger stripes and distinctive orange spots near its tail. The Swallowtail is typically seen in gardens and urban park environments. Next to the Monarch, Swallowtails are the most common variety of butterflies. In Chinese culture, two butterflies flying in tandem represent love. Butterfies symbolize a long life. In fact, in Mandarin, the word butterfly is hu-tieh, meaning 70 years. In the U.S., releasing butterflies at the end of a wedding ceremony bodes well for the marraige. The butterfly is the symbol of creativity, freedom and joy. Butterfies also represent growth and change, leaving the comfort, familiarity and safety of their cocoon to discover a new world, in a new form, trusting that their untested wings will allow them to fly with confidence, grace and freedom. A butterfly teaches us that exiting the cocoon suddenly opens a new door. It shows us the beauty and power of personal transformation. It is a natural process, just like breathing, but unlike breathing it can’t be forced or manipulated in any way. It is an inside job. Often transformation comes through hardships. We go kicking and screaming. Then one day we take a deep breath, and submit to the process of change that is brewing inside us. Other times, transformation comes to us by choice. We begin to see things more clearly and it becomes an invitation to learn, grow and change the trajectory of our lives. Whatever way it comes about, the outcome is the same. Like the butterfly, we all have the opportunity and ability to emerge from our cocoons—transformed. After my story of the uprooted 30 ft. Aleppo tree in our gated community appeared in the Los Gatos Times Observer, I forwarded it to Kathleen O’Malley, an Aqua Yoga fitness instructor at BayClub, Courtside. Like myself, Kathy is a devoted nature lover. 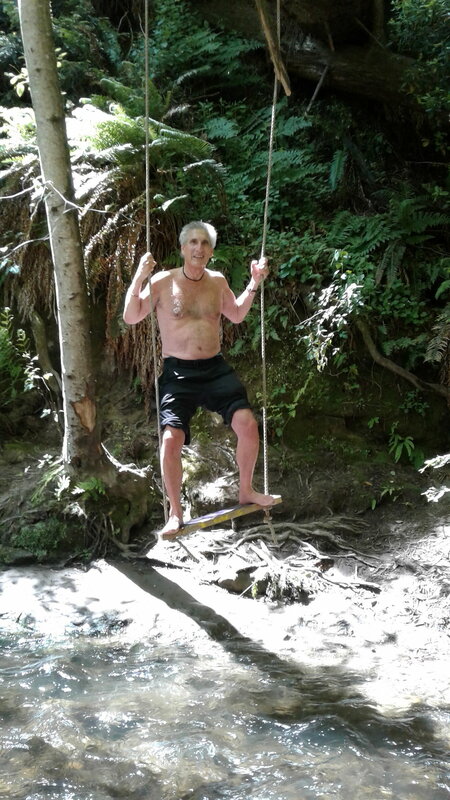 She emailed me a photo along with a note to let me know that at the moment she received my news item, she was at the Forest of Nisene Marks State Park in Aptos, CA. She was at the site of the 1,000 year old "Advocate Tree," that had toppled during the winter storms. 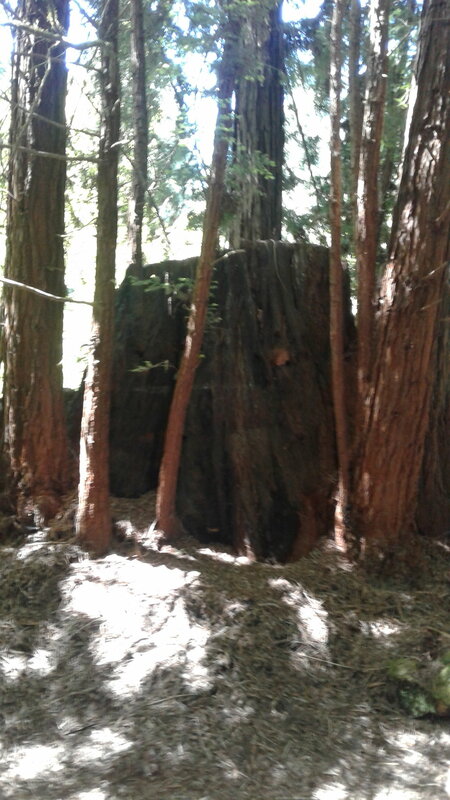 I decided I had to go see it for myself and pay my respects to this grand daddy of old-growth redwoods. So I recruited my friend Jimi Hunter to join me. Jimi and I made several attempts to find the fallen remains of The Advocate Tree by following the map (poorly, I may add) given to us by the ranger at the entrance to the park. We retraced our steps, crossed wooden bridges, and climbed over other fallen tree limbs. I even slid off a long slippery log into the creek—landing partially on my right lower extremity—while trying to get to the the other side. Fortunately my cell phone camera in my left pant pocket didn't get wet. It's been said that Sometimes you have to make a wrong turn before you find your way. My wife Cecile will tell you that's the story of my life:-). It turns out Jimi is as geographically challenged as I am. 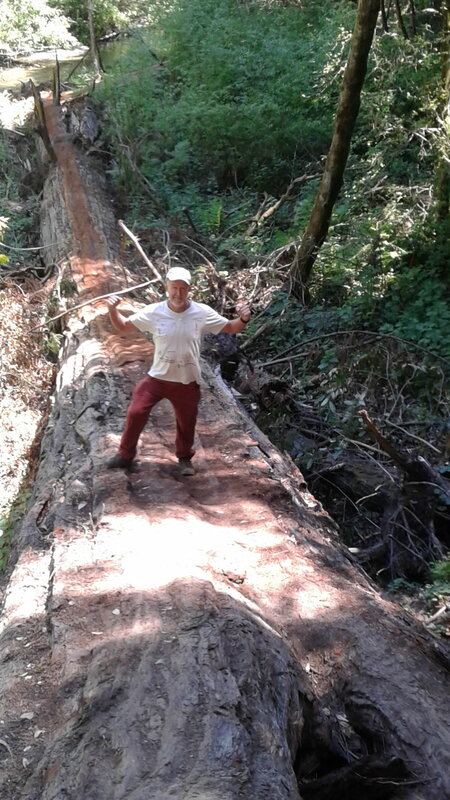 But perserverance paid off and we found the giant redwood. Before it fell from grace, The Historic Advocate Tree, was an old growth coastal redwood, more than 250 feet tall and measuring 45 feet in circumference. The majestic tree was named after a conservation group, responsible for the maintenance and improvements of the nearly 10,000 acre park including 30 miles worth of walking trails. The climb to the top of the massive 20 ft. root structure that was completely upended was somewhat daunting, especially for someone like myself who has a bit of phobia about heights. The Advocate Tree had a colorful past. It was around during the time of the Anasazi (“Ancient Ones”) cliff dwellers, believed to be ancestors of the moden Pueblo Indians. It was alive when Genghis Khan ruled Mongolia; when Joan of ark was burned at the stake; while William of Normandy invaded England; when the Spanish Conquistadors conquered the Americas, during the African Slave Trade, The Salem Witch Trials, The American Revolution and the Civil War. According to a local resident, he had heard the colossal tree topple over in a resounding crash that shook him to his core on Monday, January 9, 2017. When we got to the site, there it lay—broken into several monumental sections. I now understood why locals were saddened, feeling as if they had lost an old and faithful friend. "At the close of a summer day, tired-winged bees to a safe shelter fly, to poppies, who wrap them away...in a lullaby..."
Thanks to the record rains we had this past winter and Spring, the signature orange-golden California poppy flowers are blooming. I took the first two and fourth photo in the wooded areas behind our town house. The California poppy is an attractive native wildflower. More than a century ago, in 1903 it became the state flower and protected by state law prohibiting anyone from picking or destroying it. April 6 was dubbed California Poppy Day. On cooler, windy, cloudy days and chilly nights, the poppy closes its’ petals to protect it’s reproductive organs. The golden poppies are what the children call sleeping flowers; and as evening approaches they close up. Tucked snugly inside the petals in a warm embrace one can find bees fast asleep with their legs tucked up, and their shiny bodies covered with pollen. Early Spanish settlers called the poppy copa del ora (cup of gold) due to its cup like appearance when fully open. California poppies make their greatest showing, on the grazed lands of California hillsides since animals avoid eating the bitter-tasting plants. 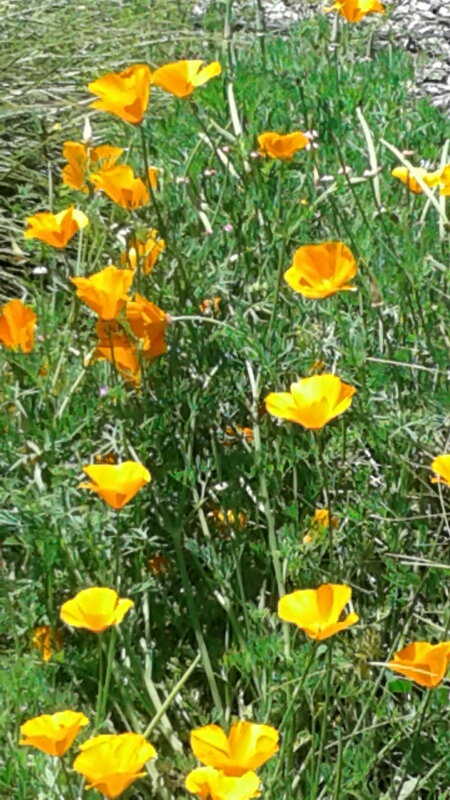 Native California Indians used poppies for food and medicine. The plants were boiled or roasted on hot stones to eat as greens. Other tribes used the flower as a potent scalp rub to kill lice, and still other tribes used it as a poultice of fresh root for toothaches. The poppy plant also has sedative and analgesic properties and some say it can be used to treat pateints with insomnia and anxiety. Photo credit: The fourth photo with the bumble bee foraging for pollen was taken by Kathy Keetley Garvey. The bees with the tired wings. And away fly the honey-bees. 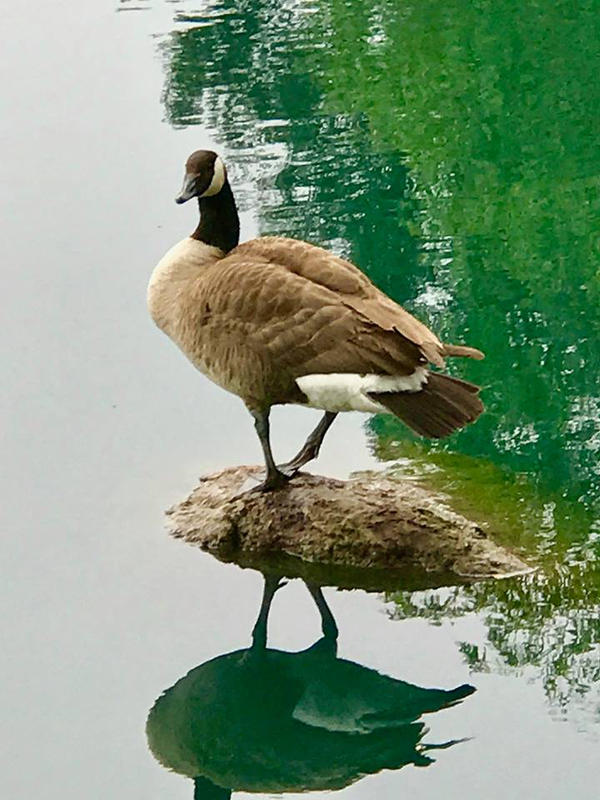 Cecile and I have been captivated by these Canada Geese and their adorable goslings we visit during our morning walk at the main lake—a stone’s throw away from where we live. 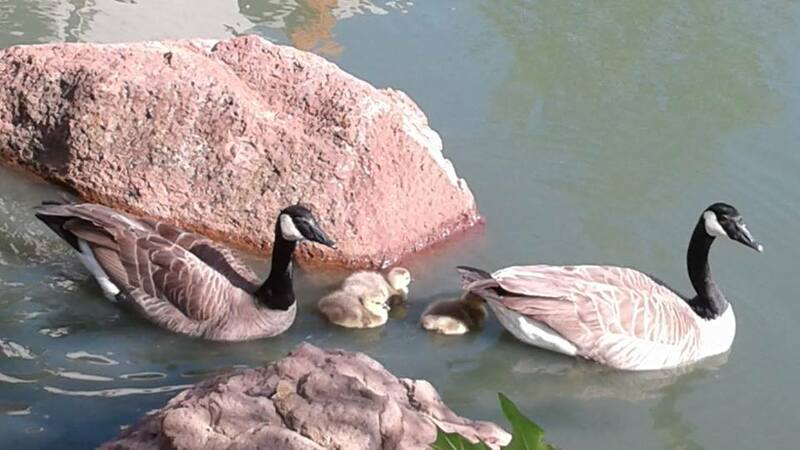 By happenstance, wildlife officials in some areas of the country began a national recovery program by taking and incubating nest eggs from “decoy” geese they had captured to lure other geese coming down from Canada. Resident geese—who have fewer challenges in the wild—can live to be 25 or 30 years as opposed to migratory geese who are exposed to CLIMATE CHANGE which on one hand improves breeding due to warmer conditions but on the hand, places the mother at more risk of being attacked by predators. There are times when clouds look majestic and fanciful and other times when they look ominous and threatening. 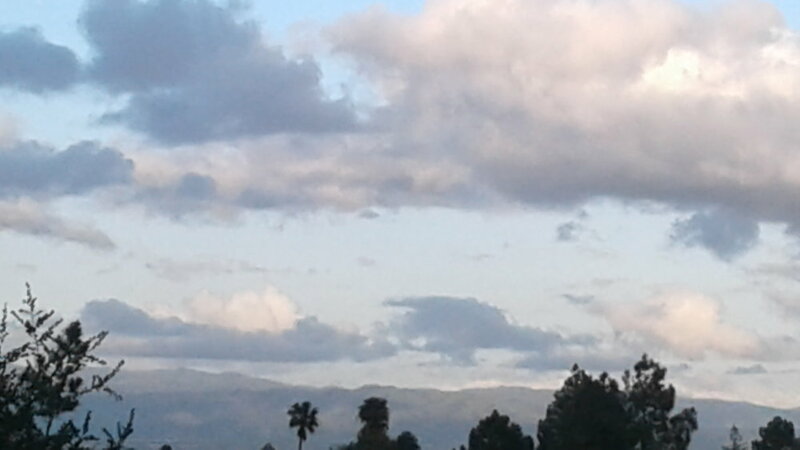 As a long time meditator I have often compared clouds to thoughts. Some thoughts are friendly, uplifting and fun. For example when things are going my way I feel like I am on a proverbial “Cloud 9." Other thoughts are strange and downright terrifying. This is when it seems everything that can go wrong “will” go wrong. As human beings we prefer clouds we like over those we don’t like. It is the same with thoughts. We embrace the thoughts that make us feel good and resist the ones that make us feel badly. In the meantime, take these wonderful clouds for what they are—expressions of atmospheric moods, Nature’s artistry and poetry in flight. In 1984, Edward Wilson, a Pulitzer Prize-winning biologist called Biophilia a human being's tendency to seek connections with nature and other forms of life. Living in a fast paced society has caused many of us to lose that precious connection with ourselves and the natural world. However, when we find ourselves living in an environment where living things are growing and thriving, it has a healing effect on our well-being. Spring is a wonderful reminder of the opportunity of being enlivened by our connection to nature. Biophilia implies a deep affection for plants, colorful flowers, trees, pets and other living things. We have a need to interact with the natural world. We do it because if feels good. It makes us healthier, lighter, and happier. In fact, at Rutgers University in my home state of New Jersey, Researchers Jeanette Haviland-Jones, a professor of psychology, and her husband, Terry McGuire, professor of genetics, both at the school of Arts and Sciences, offered convincing evidence that flowers are potent mood elevators and have an immediate impact on our happiness. From a historical perspective, the remains from the ruins found in Pompeii, in Southern Italy demonstrated that people brought plants into their houses and gardens more than 2000 years ago. Infirmaries, in monastic communities that were the sites of our first hospitals incorporated gardens on their grounds because they supported the healing process. For me, Biophilia means spending time on the walking trails behind our home, or any of the County Parks like Shoreline, Vasona; and Rancho San Antonio. It is observing the passing cloud formations, feeling the breeze, and smelling the salty air of the ocean when we are on family holiday in Maui each year. Observing the ebb and flow of the ocean waves is very meditative and leaves me feeling relaxed, centered and at peace. For others, it’s playing golf in some of the most natural and pristine settings. It is skiing, hiking in the forests, tending your garden; nurturing your orchids, playing with your dog, having lunch in the park, tea with a friend, or a bike ride on the sparsely populated scenic back roads. All of these wondrous experiences that we engage in by ourselves or with family and friends, allows us to connect with the force of energy that surrounds us and is a part of us. We have a symbiotic relationship with "all that is," which is essential to our well being, especially in these turbulent times. When we allow the business of life to overtake us, when we live inside our heads—worrying, planning, fantasizing, and when we allow our mobile devices to take control of our life in a way that is unhealthy, it is imperative that we remind ourselves and each other to reconnect with the beauty and movement of life that is always present. All we have to do is be mindful of it, change the channel in our minds and tune-in. While at my computer this past Wednesday morning at around 8 AM, I heard a loud crash and boom sound. 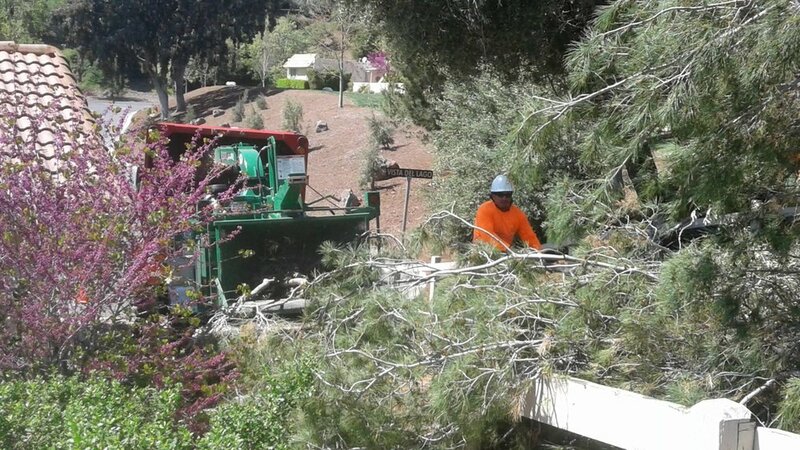 My first thought was “wow,” the landscape maintenance crew at our 100 plus acre gated community at Rinconada Hills were really noisy today. Then I went back to what I was doing. Cecile had taken our son’s dog Daisy for a walk earlier. She said a tree had fallen and it was blocking the walking trails. “That was the sound I heard earlier,” I said. She looked surprised. But, I wasn't. You see my home office overlooks the walking trails of this unusually quiet refuge. "Come on! Let’s go take a look,” I said. It was only a few hundred feet down the path. We were blown away by what we saw. A thirty foot Aleppo Pine tree was leveled to the ground leaving a fractured, rotted 5 foot high stump. It was only a matter of timing and fate that Cecile and Daisy as well as other residents were spared serious injury or worse. I felt a deep sense of relief and gratitude that they were safe. This wasn’t the first tree I had seen a tree uprooted. 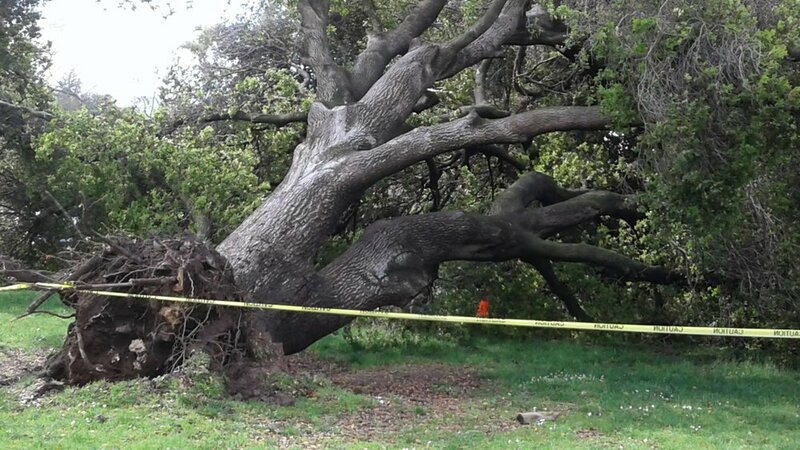 While at Vasona County Park last Saturday I saw an even a bigger tree that had toppled to the ground as seen in the first photo. It too, was completely blocking a path where a public fundraising event: Walk with Compassion to End International Child Poverty was taking place. I couldn’t help but think of something philosopher, George Berkley, postulated in the early 1700s. When he said, “If a tree falls in a forest and no one is around to hear it, does it make a sound?” This would later become a paradoxical Zen koan used to demonstrate the inadequacy of logical reasoning since there are many ways to answer. In my case, it became a moot issue, since I actually heard the sound–at least the one behind our town home. Like us humans, all trees have the potential to keel over. There are many reasons a tree dies and falls: wind, ice, snow, flood waters, and disease-like fungus induced wood decay. But most tree experts say the main reason is a phenomenon called “‘windthrow” that causes a tree to uproot. It’s like we learned in physics class. The tree trunk acts as a lever arm and when force is applied to the roots and the trunk, it begins to reach a literal “tipping point,” and is seconds crashes to the ground. After returning home I thought further about these acts of Mother Nature. The shapes of the felled tree looked almost-human like. Twisted and severed limbs. It really made me wonder if trees feel pain when falling to earth. Many from the scientific community say no. But over 40 years ago, scientists noticed an interesting phenomenon on the African savanah. Giraffes were feeding on umbrella thorn acacias, and the trees resisted the attack. Within minutes they began pumping toxic substances into their leaves. The giraffes got the message and moved on to other acacia trees. Eventually they had to abandon their efforts as the trees whose leaves were being eaten sent out a signal—via an emission of ethylene gas—to members of their own species warning them of an impending crisis. All the forewarned trees prepared themselves by pumping toxins into their leaves and the crisis was averted. While China celebrated the Year of the Rooster, The Living Desert (TLD) is celebrating the year of the Cheetah. These elegant, agile cats can sprint up to 75 mph within seconds. They are currently extinct in 20 countries. There are only 7500 living cheetahs in the wild and they could become extinct within 20 years. TLD is undergoing conservation efforts to protect them. One project that The Living Desert team is focused on three adorable two year old cheetah sisters, Sudi, Bela, and Kali. The first two graced an audience of men, women and children with their presence. A third sister, Kali, played hard to get and remained out of view. Of course, they needed a little coaxing. To accomplish this, the animal trainers hidden on one side of the long running path blew a high pitched whistle to announce their feeding time. The Bill of Fare was a favored dish of my Italian ancestors-Meatballs:-). Having gone on camera safaris in Kenya, Tanzania, Zambia, Botswana and South Africa over the years, The The Living Desert outing was an unexpected pleasure. We also visited: Giraffes, Greater Kudu from the Gazelle species, Abyssinian Ground Hornbill bird, Zebras, Smiling Goats, Warthogs, and Ankole Longhorn steers. Postscript: On this day millions of people were tuned into a live cam feed of a Giraffe named April about to give birth at the Animal Adventure Park in NY.